Lights Out is a horror movie directed by David F. Sandberg. It’s an expansion of a short video he entered into a movie festival called the Bloody Cuts Horror Challenge. Not surprisingly, the opening scene is a revamped version of his video short. Textile warehouse owner, Paul (Billy Burke) is working late and receives a video call from his young son, Martin (Gabriel Bateman) who is worried because his mom is behaving strangely and talking to herself. Paul promises he’s going to be home soon and tells Martin he’s working on getting his mother better. Moments later, when Paul is on the phone discussing his wife’s condition with someone, one his employees enters the office and interrupts his call. She’s just had an encounter with a shadowy figure and is feeling pretty shaken. Paul is too preoccupied to giver her story much consideration and simply tells her to go home. She does so, but not before urging Paul to be careful on his way out. Paul never makes it out of the warehouse though. The shadowy entity, which seems to be afraid of bright light, and can only materialize when the light is out, manages to cut the electricity supply to his office and, once she gets inside, Paul is yesterday’s news. The warehouse scenes are just preliminary stuff that do no more than introduce the shadow entity. The truth of the matter is, the movie would work just fine without them. Lights Out really begins with the introduction of Paul’s step-daughter Rebecca (Teresa Palmer). She’s in bed with her boyfriend Bret (Alexander DiPersia) and doing an excellent job of resisting his efforts to convince her to let him stay the night. They have been seeing each other for eight months and, although there is obviously a physical side to their relationship, once the deed is done, Bret is always out on his ear. The reason for Rebecca’s aloofness with her boyfriend, who she actually appears to care about a lot, is never really explained, but she is obviously still traumatised by the events that occurred when she was much younger, and still living with her mother. When Rebecca receives a call from her brother’s school, informing her Martin has fallen asleep in class and their mother is not answering the phone, she goes to the school and learns this is the third time Martin has fallen asleep during school hours and, when she speaks with her little brother, he seems very eager to go and stay with her instead of going home to his mom. Rebecca doesn’t think having her brother visit is a good idea, so she gets Bret to drive them to their mother’s house. As they are approaching the front door, Martin tells Rebecca her mother’s friend Diana has been visiting a lot. Rebecca is visibly shocked by this revelation and assures Martin she understands, stating their mother did the same thing to her when her father left. She says she had really bad dreams at the time and points out Diana is not real. When Rebecca sees how erratically her mother is behaving, she suspects she is not taking her medication and decides to take Martin home with her after all. It turns out to be an eye-opening decision because, when her brother comes home with her Diana follows. During the night Rebecca sees a shadowy entity clawing at her bedroom floor, recognizes it from past experience, and has to accept the fact that Diana is real. Although Lights Out contains plenty of clichéd scenes, such as hands reaching out from darkened doorways and grabbing people, it still succeeds in being a very good movie and the romance between Rebecca and Bret makes an interesting sub-plot. Will he ever succeed in his ambition of having a normal relationship with the woman he loves, or will the shadow entity that’s become attached to her mom remove him from the picture altogether? The relationship between Rebecca and her mother, Sophie (Maria Bello), is also interesting. There are obviously a number of issues that need to be resolved. For one thing, Sophie appears to feel that Rebecca has deserted her and Martin. Rebecca, on the other hand, seems to blame her mother for her traumatised childhood and it’s hinted she holds her responsible for the way her father upped and left and failed to keep in touch. Later, when Rebecca has discovered Diana is real, she does her best to help her mother and little brother and there are plenty of scenes with people trying to hide behind flashlights and candles, while the shadowy form of Diana lurks in darkness and tries to keep her potential victims out of the light. As far as the theme goes, Lights Out could be seen as hold hat. There are plenty of horror movies where the monster can only come out in the dark. Darkness Falls (2003) is a good example. It features a female entity known as the Tooth Fairy that targets children who’ve just lost their last baby tooth. The children that wake up and see her suffer her wrath. One of the central characters in the story fends her off with a flashlight and then spends the rest of his life sleeping with the light on and avoiding the dark. However, Lights Out has more likeable characters and is a far more enjoyable movie, though it has to be said the movie probably wouldn’t be nearly as enjoyable without Teresa Palmer, who was extremely well cast as sultry goth chick Rebecca and manages to steal the show in her every scene. If there is a loose end in this movie it’s Diana. It’s obvious right from the start of the movie Diana is not human, but she doesn’t behave like a typical ghost. After Rebecca’s wakes up and sees Diana clawing her bedroom floor, she tries to get to the bottom of things and viewers soon learn Sophie and Diana first met in the mental hospital where Sophie was receiving treatment when she was much younger. Diana (then very much alive) apparently had the ability to get into peoples heads. She also suffered from a condition that made her skin sensitive to light. Diana died in the hospital and the circumstances of her death were so unusual it raises questions about her that are never answered and it’s hard to wonder if she was supposed to be a vampire of some kind. Fans of horror movies that are filed with blood and gore may want to give Lights Out a miss. It’s very much a supernatural horror movie, but it has aspects of a family drama and little bit of romance thrown in on top to lighten the load. It may also be quite enjoyable for people who don’t normally watch horror movies and want to try something different for a change. 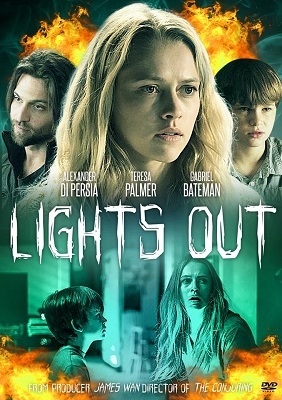 If you’re a Teresa Palmer fan though, Lights Out is probably a must-see movie and one you are going to want to add to your collection.